When I was young, for the most part I didn’t enjoy shopping trips to the market. The adults kept stopping to exchange gossip with all and sundry, which to me was a total waste of time. Things have changed: today, a visit to the farmers’ market can be an inspiration. After all, it’s not only an opportunity to catch up with people – it’s also a great way to reconnect with our neighbourhoods, the local produce and where it comes from. 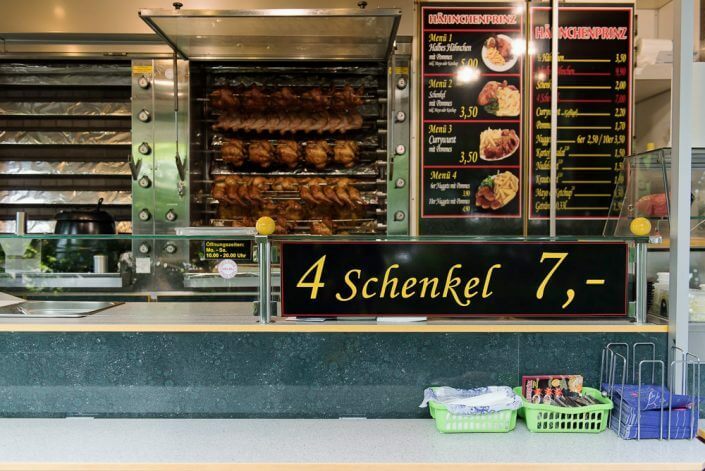 Of course you could equally do a quick shop at the supermarket – you throw the items in your cart, pay at the till, discard all the packaging the minute you get home and don’t have to talk to a single soul. But does that make us happy? 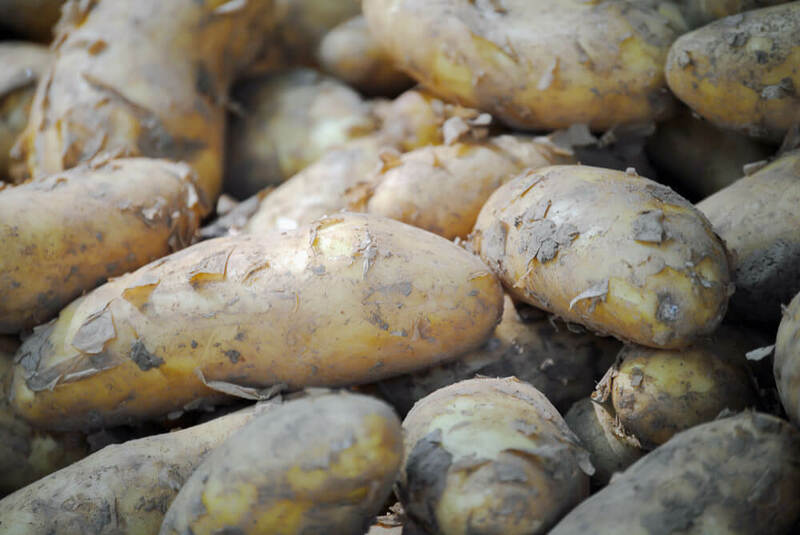 How about going back to the roots for a change and just making do with the produce that’s currently in season? Right now, farmers need all the help they can get. 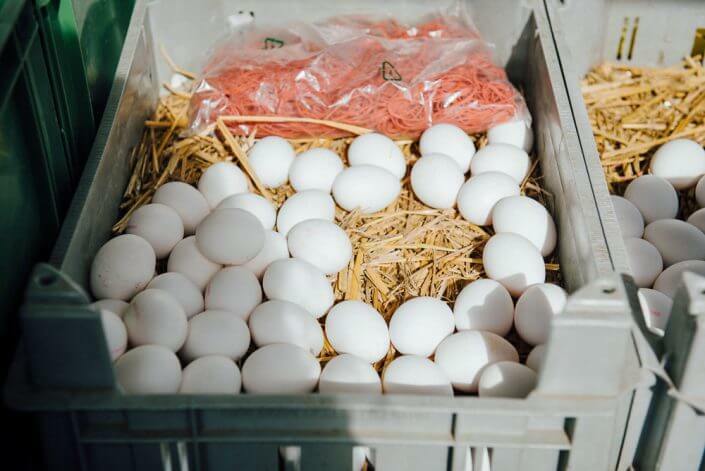 In the US, farmers’ markets have long been hip and trendy. Here in Germany, though, they’re still widely considered old-fashioned. 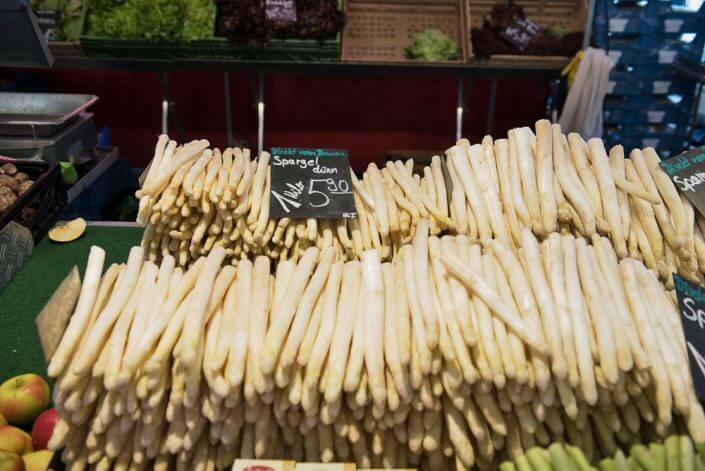 Cologne has a total of 66 farmers’ markets in 38 spots around town. Here’s my introduction to five of the most attractive ones. 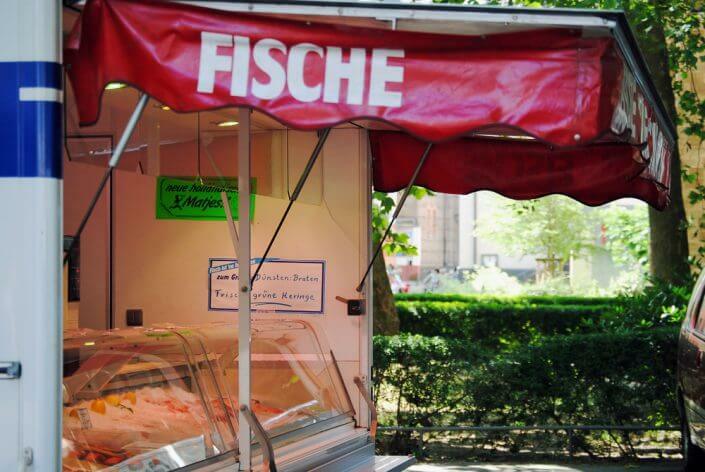 The Neptunplatz farmers’ market takes place on Tuesdays and Fridays on the square outside the Neptunbad baths. 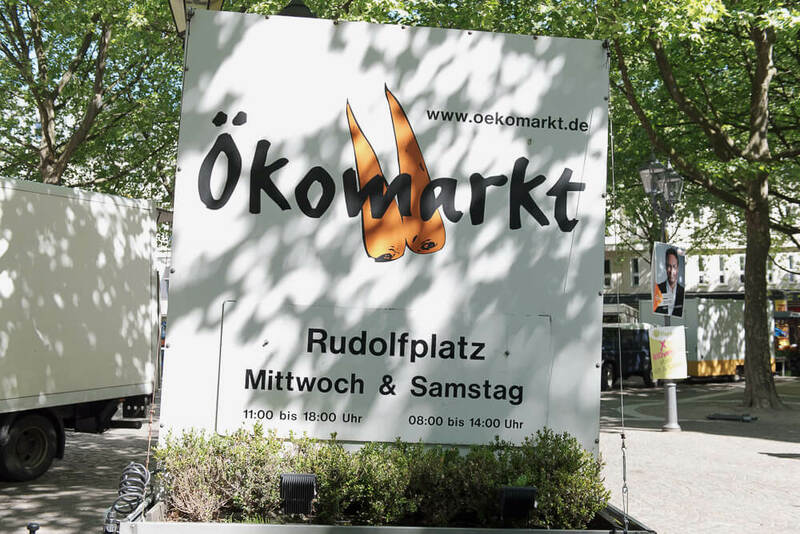 The Friday market is the busier day; business is slower on the Tuesday, with lots of competition from the supermarkets in Ehrenfeld. 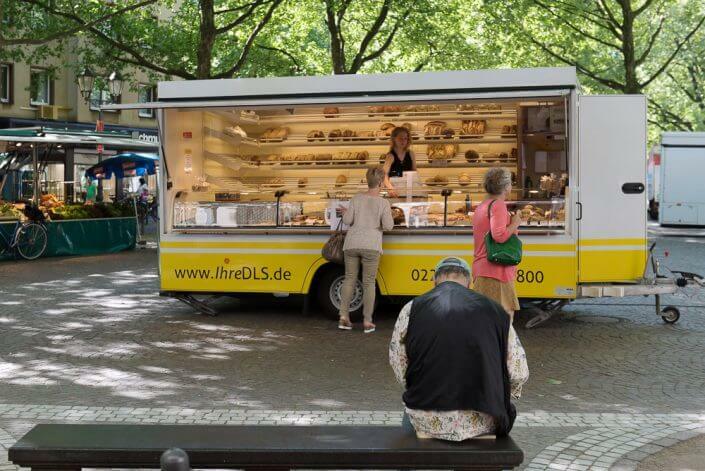 One of the stallholders who is there no matter what is 85-year-old Ludwig Broicher. 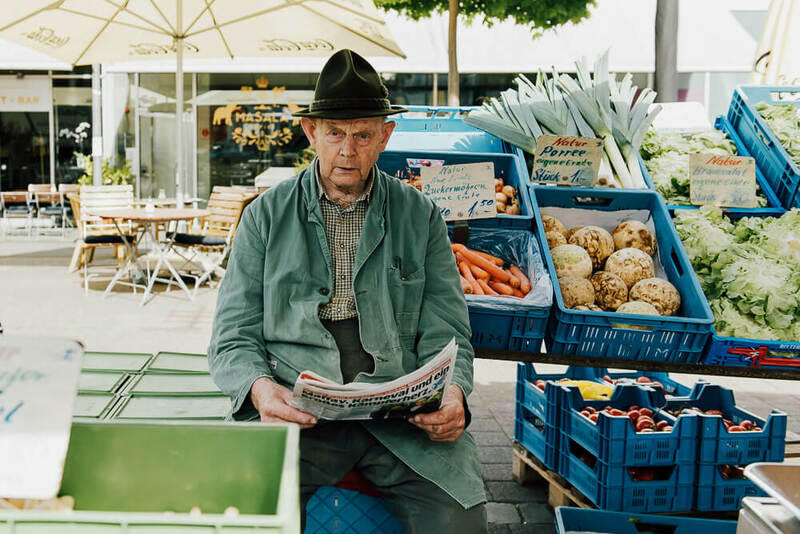 For decades, Ludwig has risen at four in the morning twice a week to sell his wares. 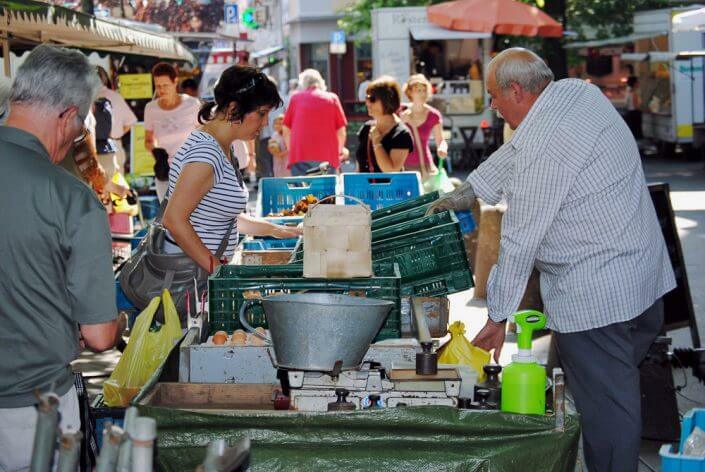 So why would I suggest you visit a market that’s less than busy during the week? Well, for a starter, you can meet Mr Broicher in person. It took nothing more than a brief conversation with him for me to start questioning my daily routine. He and his brother, who live in Cologne-Zündorf, have sold their vegetables on Cologne’s farmers’ markets since 1948 (!). 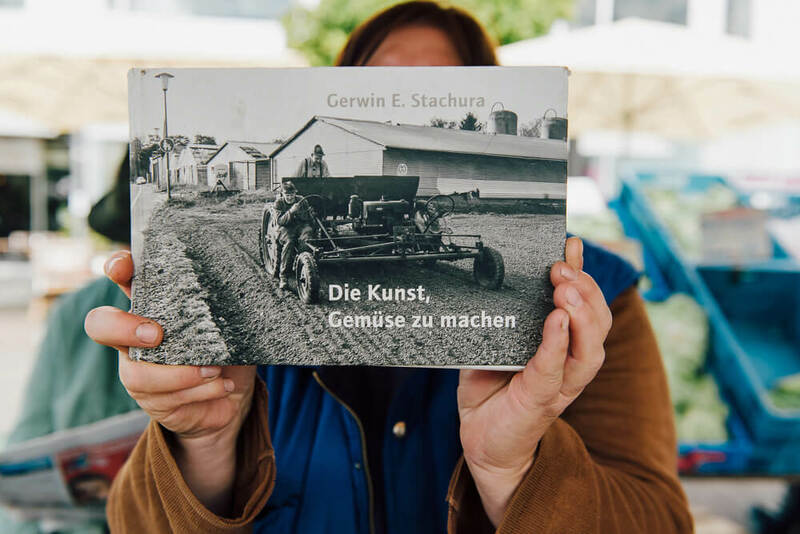 They recently published an illustrated book entitled Die Kunst, Gemüse zu machen (The art of making vegetables). It’s not easy to get hold of – but you might be lucky to get a copy at the market. Look out for the eggs, too, which are delicious, so I am told. All farmers’ markets have their regulars, and Auerbachplatz market is no exception. Many of them are likely drawn by the delicious smell of roast chicken, which wafts across the square twice a week. 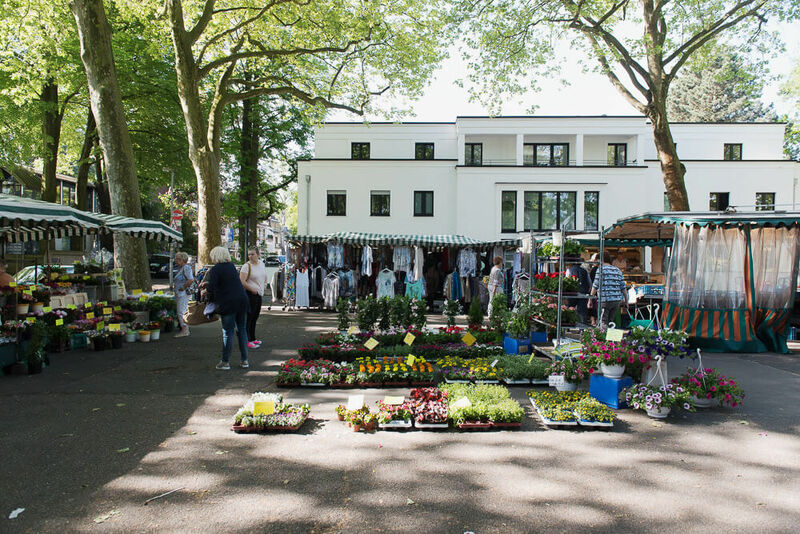 This market has a great atmosphere – especially when the sun is out, it’s a great place not just to stock up on local produce, but also to hang out at one of Café Balthasar’s many outdoor tables. A fenced-off playground makes the Auerbachplatz market a perfect option for families, too. 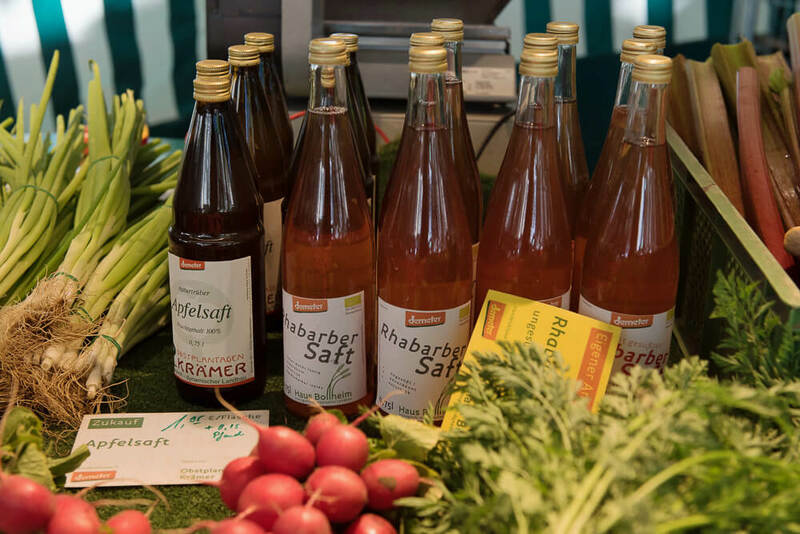 The organic market on Rudolfplatz, which takes place on Wednesdays, is the perfect option for night owls. 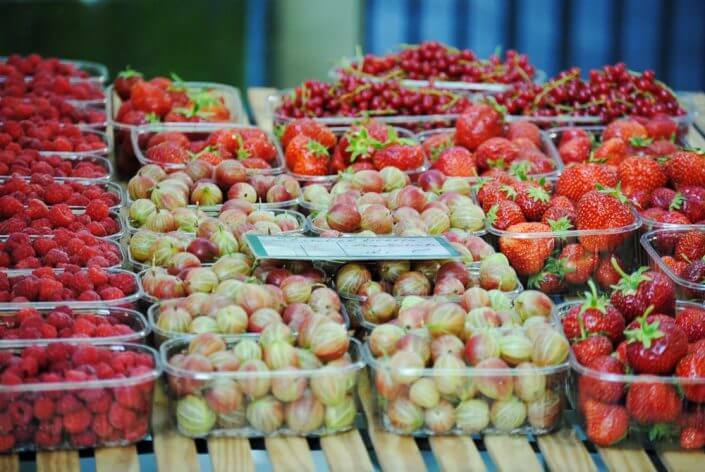 It opens and closes much later than any other farmers’ market and is clearly geared to a younger clientele. 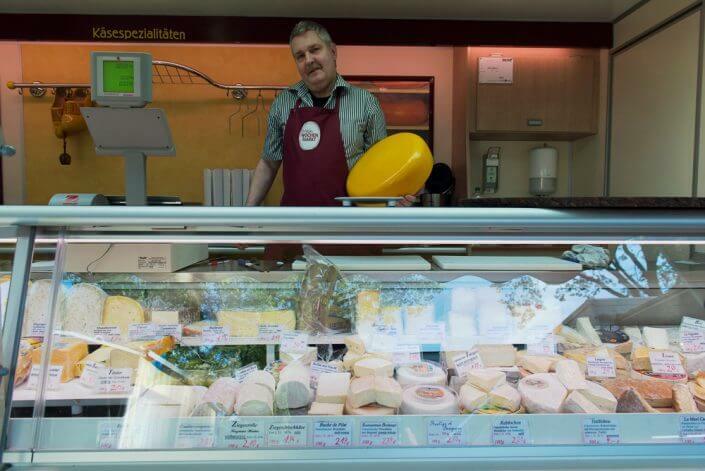 Fruit and veg, bread and baked goods, and meat and dairy products are regularly on offer here. 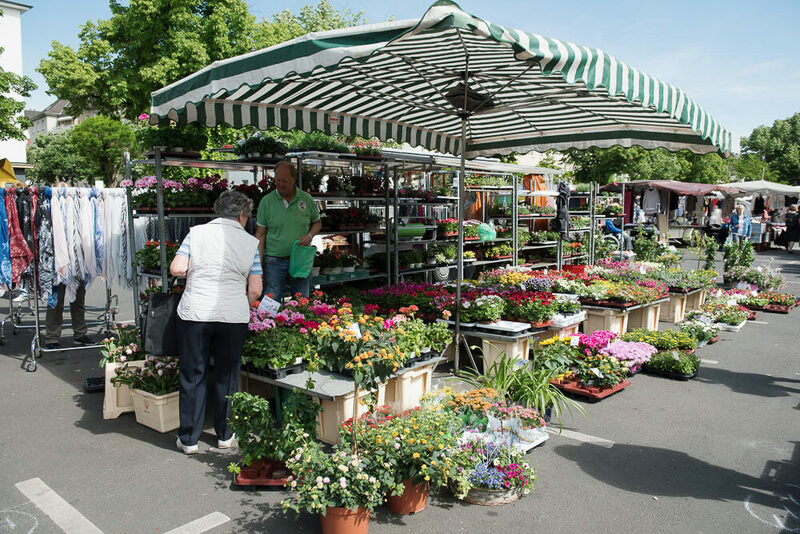 Thanks to its city centre location, the market is easily reachable by public transport and hence attracts a lot of passing trade. At the farmers’ market in Weiden, you’d be forgiven for thinking you are in France. Surrounded by tall old trees and mansion-like houses, time stands still. Unlike on many other market squares, it’s very quiet here with little traffic. The stalls sell everything you would expect to see at a farmers’ market – right now, asparagus is in season – but a real eye-catcher is Mr Franken and his distinctive handlebar moustache, who turns up every Wednesday to sell potatoes. The farmer’s market on Deutzer Freiheit, the district’s high street, exudes old-fashioned village charm – and I mean that in the nicest way possible! 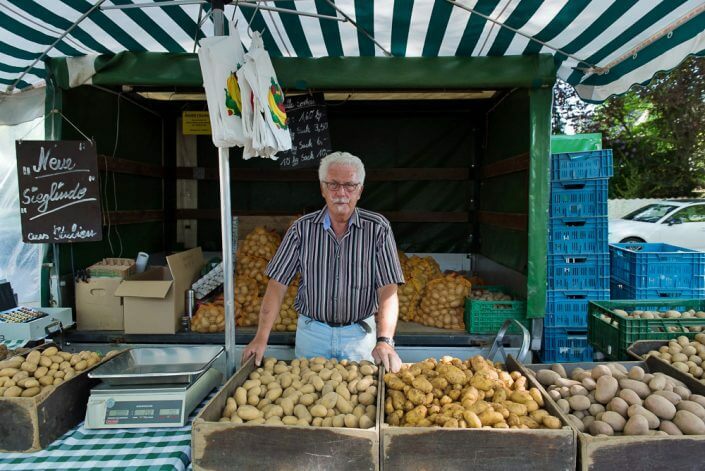 Every Friday, the farmers come here to sell regional produce. 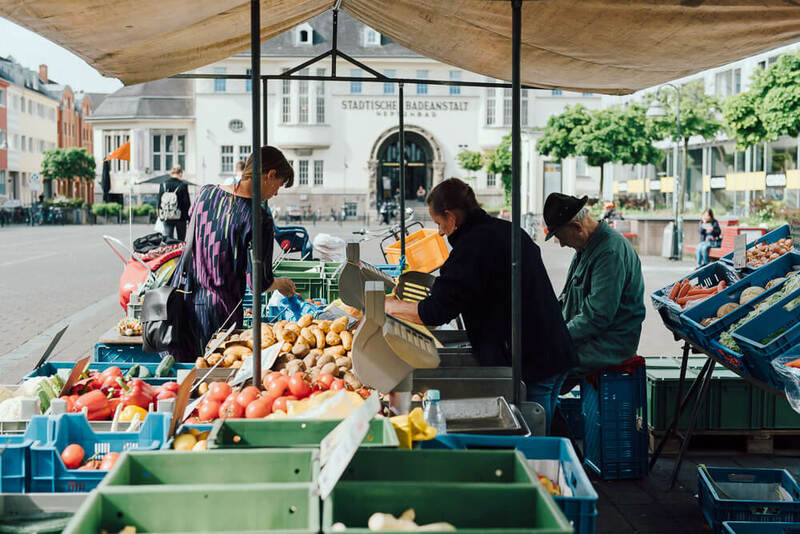 It’s a great way to ring in the weekend: thanks to its real neighbourhood feel, this market is a perfect antidote to the fatigue frequently felt by urban citizens at the end of a busy week.